We collaborate and exchange ideas with academics and practitioners in professional communities and nurture the learners in professional commmunication. 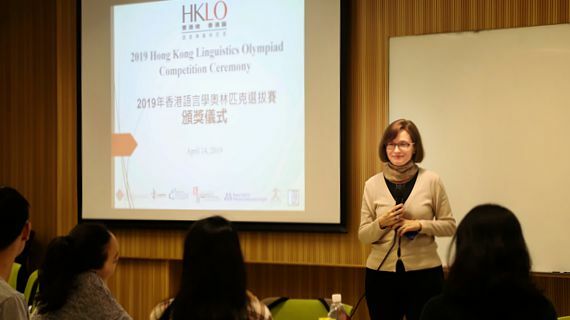 14 April, 2019 - The Department of English (ENGL) and the Research Centre for Professional Communication in English (RCPCE) is proud to co-sponsor the Hong Kong Linguistic Olympiad. 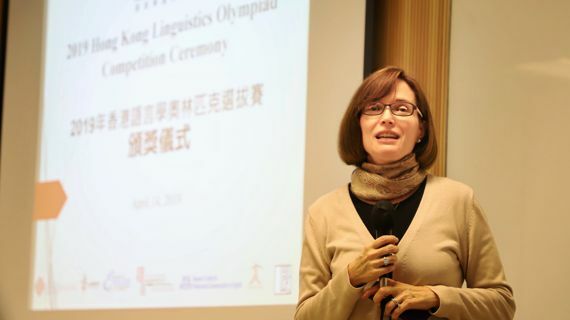 Professor Kathleen Ahrens, ENGL Professor and RCPCE Director gave a talk at the award ceremony on April 14th, 2019 and encouraged high school students to continue to aim high in their linguistic endeavors. 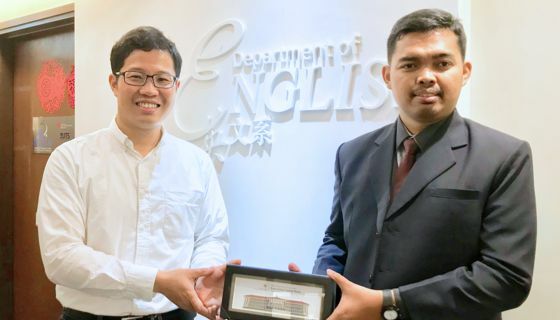 8 April, 2019 - Mr. Ahmad Maum and his team from the Vocational College, Universitas Gadjah Mada visited RCPCE on 8 April, 2019. We are happy to share our ideas and practices on how laboratories support research activities. 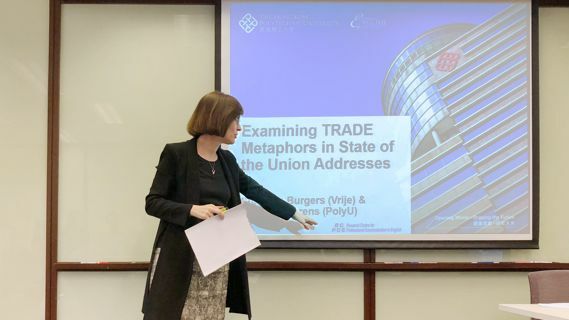 4 April, 2019 - Our Centre Director Professor Kathleen Ahrens shared her research on the one-day Cross-Disciplinary Roundtable Workshop jointly organised with the School of Accouting and Finance, the Department of Chinese and Bilingual Studies and the Department of English of The Hong Kong Polytechnic University. The aim of the workshop is to exchange research ideas and practices accross disciplines and initiate interdisciplinary collaboration, and also share disciplinary specific research knowledge with our PhD students. 16 November 2018 - Mr. Mike Cai, a Year 11 student who is studying at Renaissance College Hong Kong, finished his internship in November 2019 under the supervision of our Project Associate Mr. Amos Yung. 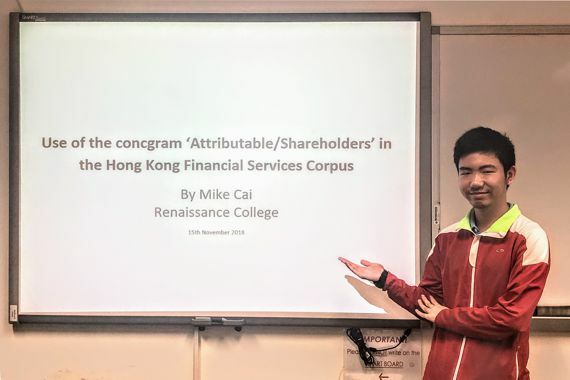 Mike assisted RCPCE to write a short report on the technical terms used in Hong Kong financial sector with the corpus linguistics software 'ConcGram' developed in the Department of English in 2008. 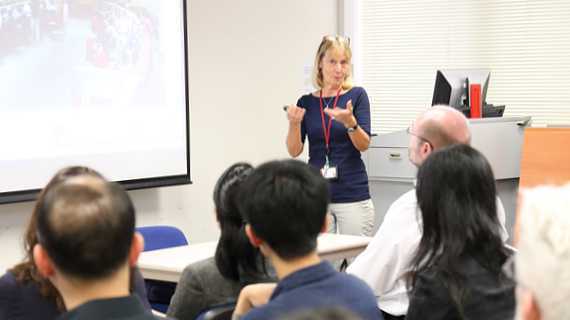 27 April, 2018 - Our Associate Director Dr. Jane Lockwood and our PhD student Ms. Carol Yu shared their research findings in workplace studies and revealed why English language communication breaks down in a range of virtual settings and what communication strategies may lead to improvements. The seminar was attended by around 40 participants in this seminar. 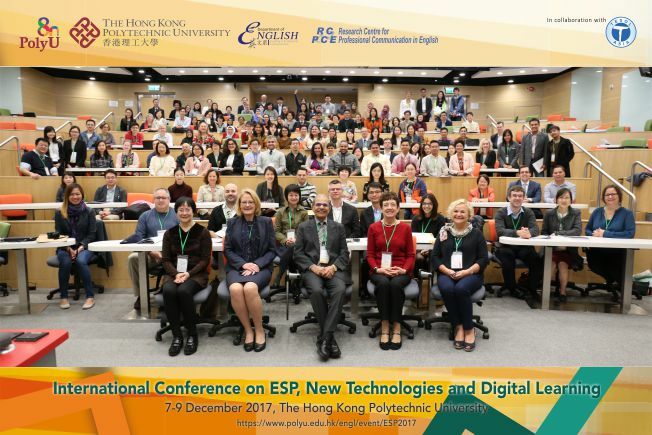 7-9 December, 2017 - The International Conference on ESP, New Technologies and Digital Learning was successfully held from 7 – 9 December at PolyU. About 220 participants from 22 countries/regions joined the conference and there were 154 presentations delivered by 185 presenters. Prof. Vijay Bhatia, Prof. Rod Ellis, Prof. Diane Pecorari, Prof. Bernadette Watson, and Dr Beata Webb each gave a keynote speech. Four of the keynote speeches can be viewed at ENGL YouTube channel. The conference aims to bring together teachers, researchers and students in English for Specific Purposes (ESP) to contribute to a stimulating and dynamic exchange of ideas in ESP, new technologies and digital learning. We hope the event gave a fruitful experience to the participants and offered them a platform to network with people with same interest in the fields. We would like to thank those who participated and made the conference successful!